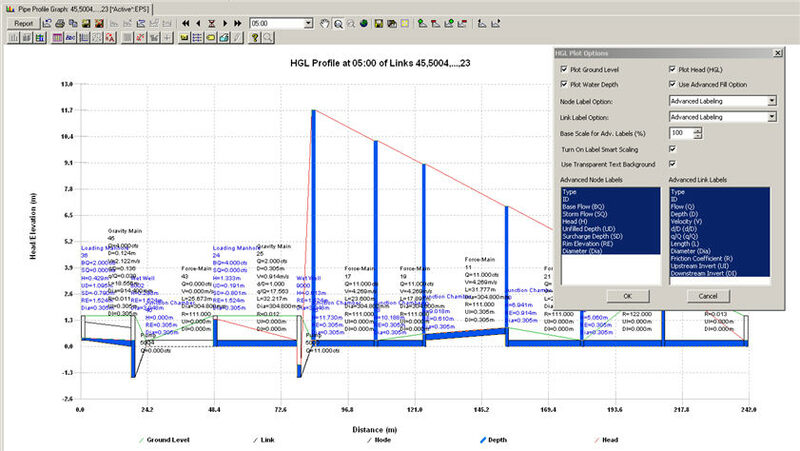 · Single-Point Curve – A single-point pump curve is defined by a single head-flow data point describing the desired pump operating point (design point).InfoSewerH20Map Sewer assumes that the cutoff head (at zero flow) is 133% of the design head and the maximum flow (at zero head) is twice the design flow. It then treats the curve as a three-point curve. 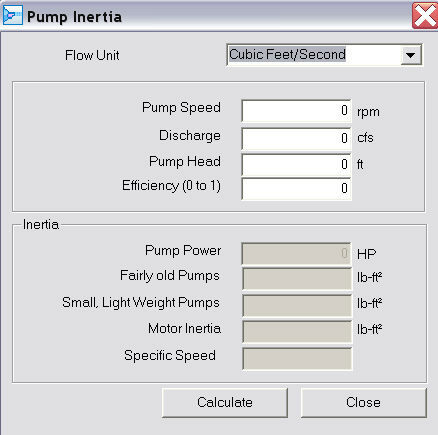 The pump inertia dialog box is shown below. Click here for the methodology. • Pump Speed – Pump speed (number of revolutions per unit time). • Discharge – Rated pump flow rate. • Pump Head – Rated pump head corresponding to the rated pump discharge. • Efficiency – Pump efficiency (ratio of power output to power input). • Pump Power – Power computed from pump head, pump flow and pump efficiency. • Fairly Old Pump – Pump inertia computed assuming that the pump is fairly old. • Small, Light Weigh Pump – Pump inertial computed assuming that the pump is small and light weight. • Motor Inertia – Inertia of the motor. • Specific Speed – Specific speed of the pump. Note: The total (or combined) inertia of a pump is the sum of the pump inertia and the motor inertia. The pump inertia is the momentum of inertia of pump impeller and entrained liquid, while the th motor inertia is the momentum of inertia of motor rotor, shaft, and couplings. For transient analysis, the total inertia should be used to properly describe the pump’s resistance to change in momentum. The higher its inertia, the longer it will take the pump to stop spinning after a shutdown. Pump inertia can be increased using a flywheel (may not be effective for very long pipes).